Try this recipe with two cups of cauliflower or broccoli florets added to the spaghetti pot during the last five minutes of cooking time. Spread the hazelnuts and the walnuts out evenly on a sheet pan. Place the sheet pan in the preheated oven and roast the nuts for 15 minutes until the nuts turn a darker brown in color. After the nuts have roasted, turn off the oven and set the nuts aside. Cook the spaghetti in a pot of boiling, salted water according to the package instructions. 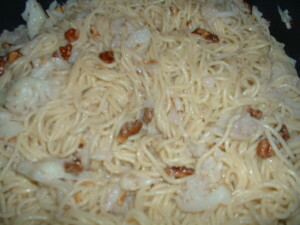 Reserve one cup of the pasta water before draining the cooked spaghetti in a colander. Into a 14 inch shallow pan, add the olive oil, the anchovy paste, the garlic, the sea salt, and the crushed red pepper flakes. Cook on medium heat while stirring for two minutes. 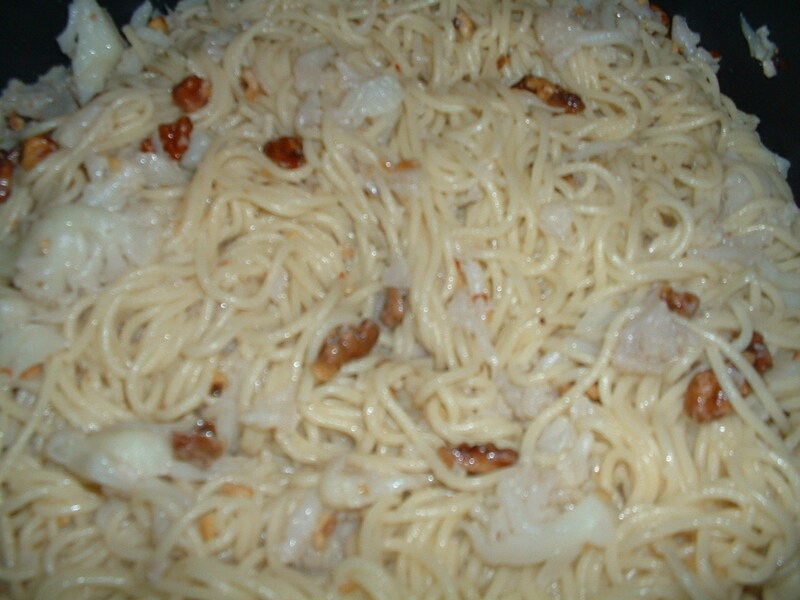 Add the cooked pasta to the pan. Mix well to coat the pasta well with the olive oil and the other ingredients. Turn the heat up to medium high and add the reserved pasta water. Continue to cook while stirring for two more minutes. Add the roasted nuts and mix well. Turn off the heat and serve. Into a Dutch oven, add the flour and the vegetable oil. Put the pot on medium heat. Start by whisking the flour and the vegetable oil to get out any lumps. Continue to cook the mixture while stirring with a wooden spoon until it takes on a dark brown color. This will take about 20 minutes. Turn off the heat. Add the onions. Cook while stirring for 2 minutes. Turn the heat up to medium high. Add the sausage, the garlic, the green bell pepper, and the celery. Cook while sitrring for 2 minutes. Add the tomato puree, a teaspoon of sea salt, the cayenne pepper (as much as you want), and the bay leaf. Stir the mixture to incorporate all of the ingredients. Add the stock to the pot and bring the mixture to a slight boil while stirring frequently. After the mixture begins to boil, turn the heat down to low. Tie the thyme and the parsley sprigs together with butcher’s twine. Add this herb bundle to the pot. Add the okra to the Dutch oven. Cover and simmer on low heat stirring occasionally for 40 minutes. After 40 minutes, remove the bay leaf and the herb bundle from the pot. Taste the gumbo and add more sea salt and/or cayenne pepper, if desired. Remove the lid and turn the heat up to medium. Sprinkle the shrimp with sea salt and red cayenne pepper. 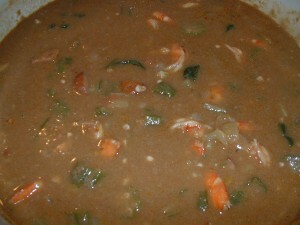 Add the shrimp and let the gumbo cook with the lid off until the shrimp begin to curl and become pink in color. Turn the heat off. 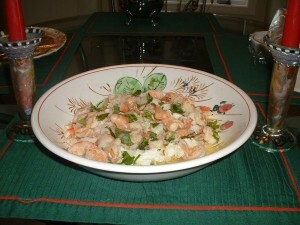 Serve with grits or white rice. Garnish with chopped scallions and chopped Italian parsley. Put a 12-14 inch shallow pan on medium high heat. Heat the pan for 4 minutes. Add the canola oil and the sesame oil. Continue to heat the pan for an additional minute and then add the mushrooms. Cook the mushrooms without touching them for 4 minutes. After 4 minutes, turn the mushroom slices and cook them for an additional two minutes. Add the ginger, the garlic, the sea salt, and the scallions to the pan. Cook while stirring for one minute. Add the chicken stock, the Sriracha sauce, and the soy sauce. Cook while stirring for one minute. Add the broccoli florets and the snow peas. Cover the pan. Reduce the heat to medium low. Cook for about 7-10 minutes until the broccoli is tender. Into a mixing bowl, add two tablespoons of Chinese five spice, a teaspoon of sea salt, a teaspoon of dry mustard, and the cayenne pepper. Mix all of these dry spices well. After the spices are well blended, rub this mixture evenly all over the pork loin. Place the pork loin (fat cap up) in a roasting pan. Put the pan into the oven and roast the pork loin for two hours. Into a sauce pan, add the ketchup, a tablespoon of Chinese five spice, a teaspoon of dry mustard, the ground ginger, the onion powder, the garlic powder, a 1/2 teaspoon of sea salt, the Sriracha sauce, the soy sauce, and the oyster sauce. Cook the mixture on low heat while stirring until all of the ingredients are incorporated. Brush the sauce on the pork loin before the last fifteen minutes of roasting time. Let the pork loin sit covered with aluminum foil for 10-15 minutes before carving. Serve any leftover sauce on the side. Into a 12-14 inch shallow pan, add the olive oil, the red onion, the garlic, a pinch of crushed red pepper flakes, and a pinch of sea salt. Cook on medium high heat for two minutes. Add the the white wine and the clams. Cover the pan. Cook until all of the clams open. This will take about 7-10 minutes. Discard any clams that do not open after 10 minutes. 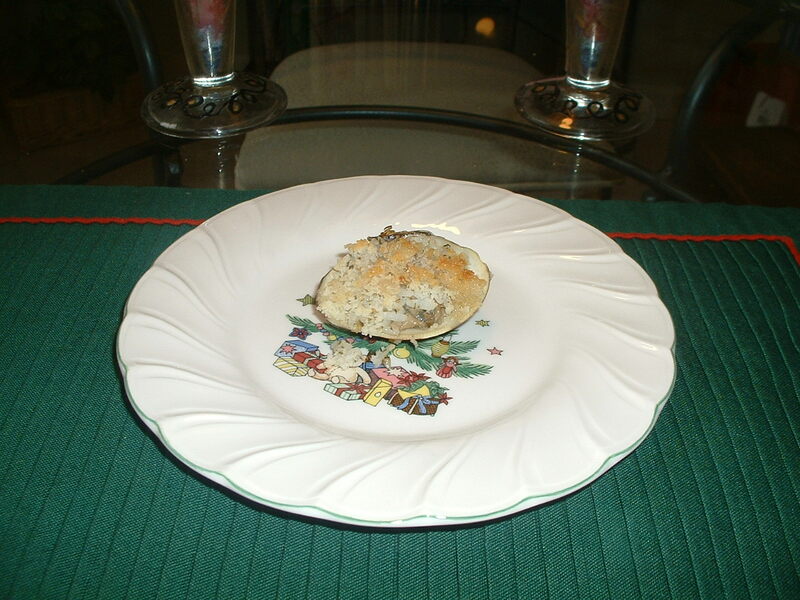 Remove the cooked clams from the shells. Finely chop the cooked clams and add them to the rice. Add the oregano and the parsley. Mix the the clam and rice mixture well. Taste and add more sea salt and/or crushed red pepper flakes, if desired. Spoon the rice and the clam mixture uniformly into each clam shell. Place an equal amount of bread crumbs on top of the rice in each clam. Drizzle a small amount of olive oil on top of the bread crumbs. Place the filled clams under the broiler. Cook until the bread crumbs are crispy and golden brown. Serve with lemon wedges. 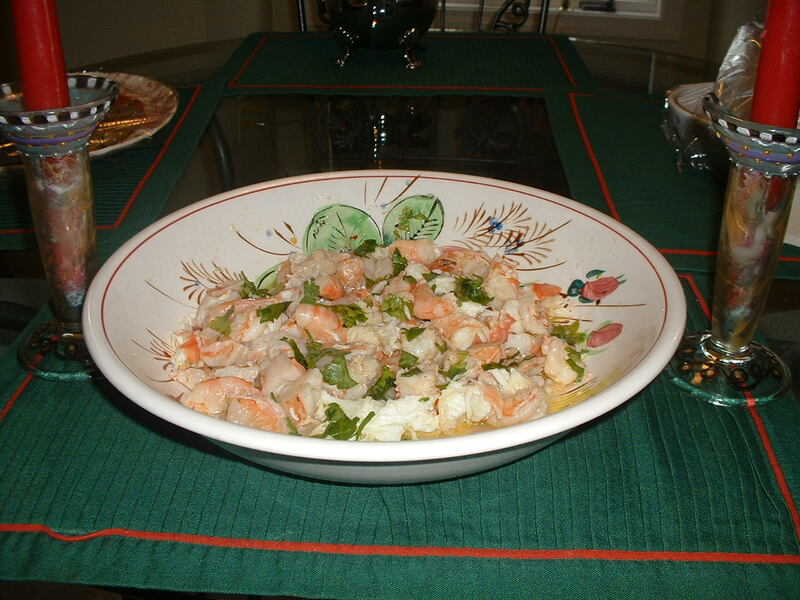 Into a medium pot, add the shrimp, the juice of 1/2 lemon, and three teaspoons of sea salt. Cover the shrimp with cold water. Put the pot on high heat. Bring the water to a boil. When the water begins to boil, remove the pot from the heat. Drain the shrimp and set it aside. Into a salad bowl, add the minced garlic, 1/2 teaspoon of sea salt, a pinch of crushed red pepper flakes, and a pinch of ground black pepper. Mash with a fork to form a paste. Add the lemon juice. Whisk the mixture until the ingredients are well blended. While whisking, slowly drizzle in the olive oil. Continue to whisk the dressing until it is smooth and thickened slightly. Taste and add more sea salt, black pepper, and/or crushed red pepper flakes, to taste. Add the crab meat and the cooked shrimp. Toss the seafood gently until it is coated with the dressing. Add the parsley. Mix again. Refrigerate the salad for at least an hour. Serve at room temperature. Into a mixing bowl large enough to hold the asparagus, add the garlic and 1/4 teaspoon of sea salt. Using a fork, mash the garlic into a paste. Add the crushed red pepper flakes and the anchovy paste. Mash again. Add the lemon juice and whisk until smooth. While whisking, slowly drizzle in the olive oil. After all of the olive oil has been added, continue to whisk until the mixture is smooth and thickened slightly. Taste the dressing and add more sea salt and/or crushed red pepper flakes, if desired. Into a 12-14 inch shallow pan, add two cups of cold water, the asparagus, and 1/2 teaspoon of sea salt. Bring the water to a boil. Cook the asparagus in the boiling water until tender. Drain the asparagus in a colander. While the asparagus is still warm, add it to the mixing bowl with the dressing. Toss gently so that all of the asparagus spears get coated with the dressing. Serve immediately. This side salad is an elegant and colorful accompaniment to a holiday meal or dinner party. Into a salad bowl, add the mustard and the vinegar. Whisk these two ingredients until smooth. While whisking, slowly drizzle in the olive oil. Continue to whisk until the dressing is well blended and thickened slightly. Taste and add sea salt and ground black pepper, as needed. Season the lettuce leaves with sea salt and ground black pepper. Add the seasoned lettuce to the salad bowl with the dressing. 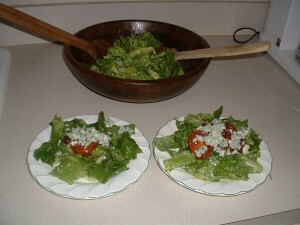 Gently toss until all of the lettuce leaves are coated with the dressing and begin to wilt slightly. Top this salad with crumbled blue cheese, bacon bits, and/or sun dried tomatoes. Many cultures believe that eating legumes on New Year’s Day brings good luck. Into a soup pot, add the olive oil and the sausage. On medium high heat, brown the sausage on all sides. After the sausage links are browned, remove and set them aside to cool. Add the carrot, the celery, the onion, the garlic, two teaspoons of sea salt, and a teaspoon of ground black pepper to the pot. Stir and scrape the bottom of the pot to loosen the brown bits that have accumulated. Cook while stirring frequently for five minutes. Add the lentil beans with the can juices to the pot and stir the mixture well. Add the chicken stock and turn the heat up to high. Stir well and bring the mixture to a boil. Cover the pot and reduce the heat to low. Simmer the soup for 35 minutes stirring occasionally. After 35 minutes, taste the soup and add more sea salt and/or ground black pepper, if desired. Cut the sausage into about one inch wide pieces and add it to the soup. Add the chopped parsley and serve. Serve with mashed potatoes, oven roasted yukon gold potatoes, or orzo risotto (all of these recipes are posted on this web site). Sprinkle sea salt and ground black pepper on all sides of the lamb shanks. Put a large Dutch oven on the stovetop. Turn the heat up to medium high. After four minutes, add the olive oil. Put the lamb shanks into the Dutch oven and brown them on all sides. Note: Do not crowd the Dutch oven as this will hinder the browning process. Depending on the size of the shanks, they may need to be browned in batches of two or three. 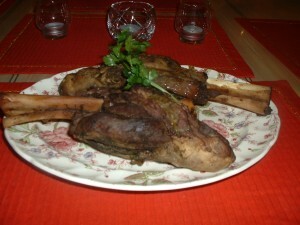 After the lamb shanks have been browned, remove them from the pot and place the shanks on a plate. Add the carrot, the celery, the onion, the garlic, a teaspoon of ground black pepper, and two teaspoons of sea salt to the Dutch oven. Stir and scrape the bottom of the pot to loosen any of the brown bits. Cook the vegetables for four minutes stirring frequently. Add the wine and scrape the bottom of the Dutch oven again to loosen any of the remaining brown bits. Let the wine and the vegetables cook for five minutes on medium high heat. Add the anchovy paste and the tomato paste. Stir until well blended. Add the lamb shanks back into the pot (bone side up and meaty portion down). Add enough chicken stock to cover the lamb shanks about halfway. Tie the parsley stalks, the rosemary stalk, and the thyme stalks into a bundle with cooking twine. Drop the herb bundle into the Dutch oven with the lamb shanks. Cover the top of the Dutch oven with aluminum foil and put it into the preheated oven. Bake for two hours until the lamb shanks have shrunk and the bones are exposed. Note: the lamb shanks should look like lollipops. Remove the lamb shanks to a roasting pan and cover them with aluminum foil. Place in the oven set at 170 degrees to keep the shanks warm until serving time. Skim any excess fat off of the top of the braising liquid. Strain this liquid through a colander (with a paper towel in it) to remove any of the solids. Put the strained braising liquid into a saucepot. Put the sauce pot on the stove top. Cook the liquid on medium heat to reduce it by a third. After the braising liquid has been reduced, taste it and add more sea salt and/or ground black pepper, if desired. Turn the heat off and whisk in the butter until the sauce is smooth and thickened slightly. Serve the sauce with the lamb shanks.